Once per turn: You can Special Summon 1 Zombie-Type monster from your hand. You must control no monsters to activate and to resolve this effect. This card's effect is similar to Summon Cloud, Valhalla, Hall of the Fallen, Frontline Base, Water Hazard, Teleport and Herculean Power. Also, Call of the Mummy as well as Valhalla, Hall of the Fallen, are not restricted in the same manner as Summon Cloud, Frontline Base,Water Hazard, Teleport or Herculean Power" in that, barring summoning requirements and a monster on the field, one can bring just about any Zombie (or in Valhalla's case, Fairy) out. 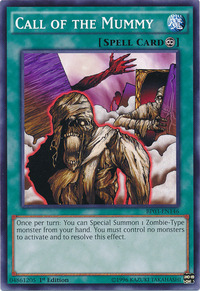 When you activate the effect of "Call of the Mummy", you can Special Summon a high-level monster from your hand like "Giant Axe Mummy" or "Vampire Lord", but not a Special Summon-only monster like "Fushioh Richie". You can only activate "Call of the Mummy"s effect during your Main Phase. You select a monster from your hand when you resolve "Call of the Mummy"s effect, not when you activate the effect. 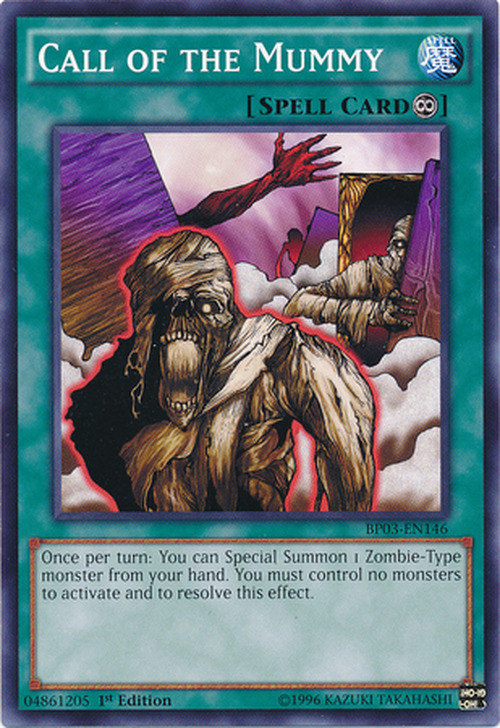 If you have multiple copies of "Call of the Mummy" in play, you can only Special Summon 1 Zombie because when you try to activate the second "Call of the Mummy", you now have a monster on your side of the field so its effect does not apply. Ojama Trio: When you chain "Ojama Trio" to your opponent's "Call of the Mummy" effect, the effect of "Call of the Mummy" is negated.